Corn starch, cornstarch, cornflour or maize starch or maize is the starch derived from the corn (maize) grain or wheat. The starch is obtained from the endosperm of the kernel. Corn starch is a popular food ingredient used in thickening sauces or soups, and is used in making corn syrup and other sugars. Cornstarch was discovered in 1840 by Thomas Kingsford, superintendent of a wheat starch factory in Jersey City, New Jersey. 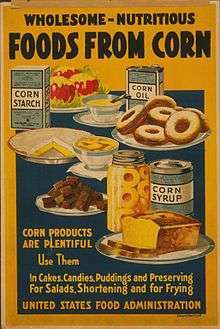 Until 1851, corn starch was used primarily for starching laundry and other industrial uses. Cornstarch is used as a thickening agent in liquid-based foods (e.g., soup, sauces, gravies, custard), usually by mixing it with a lower-temperature liquid to form a paste or slurry. It is sometimes preferred over flour alone because it forms a translucent mixture, rather than an opaque one. As the starch is heated, the molecular chains unravel, allowing them to collide with other starch chains to form a mesh, thickening the liquid (Starch gelatinization). It is usually included as an anti-caking agent in powdered sugar (10X or confectioner's sugar). Baby powder often includes cornstarch among its ingredients. A common substitute is arrowroot, which replaces cornstarch on a 1:1 ratio. Cornstarch added to a batter which coated chicken nuggets increased oil absorption and crispness after the latter stages of frying. Cornstarch can be used to manufacture bioplastics. Cornstarch is the preferred anti-stick agent on medical products made from natural latex, including condoms, diaphragms and medical gloves. Prior usage of talc was abandoned as talc was believed to be a carcinogen. Food producers reduce production costs by adding varying amounts of cornstarch to foods, for example to cheese and yogurt. This is more common in the United States of America where the Congress and the Department of Agriculture subsidize and reduce its cost to food manufacturers. When roasted in a standard oven it produced dextrin, a chemical compound with uses ranging from adhesive to binder for fireworks. Cornstarch is used to supply glucose to humans who have glycogen storage disease (GSD). Without this, they would not thrive (i.e. little, if any, weight gain) and thus die. Cornstarch can be used starting at age 6 – 12 months which allows feeds to be spaced and glucose fluctuations to be minimized. Corn starch shown on a poster, upper left. On June 27, 2015, flammable starch-based powder fueled the Formosa Fun Coast explosion in Taiwan. Called cornstarch in the United States and Canada. Called cornflour in the United Kingdom, Ireland, Israel and some Commonwealth countries. Not to be confused with cornmeal. Often called maizena in the Netherlands, Belgium, France, Germany, Finland, Austria, Italy, Portugal, Morocco, Brazil, Norway, Denmark, Slovakia, Sweden, Switzerland, Spain, South Africa and Latin America, after the brand. ↑ "Cornstarch | Definition of Cornstarch by Merriam-Webster". Merriam-webster.com. Retrieved 2016-05-14. ↑ "Corn starch". Everything2. Retrieved 2011-06-12. ↑ Manley, Duncan (1998). Biscuit, cookie and cracker manufacturing manuals - Manual 1 - Ingredients. Cambridge, England: Woodhead Publishing Limited. p. 34. ISBN 1 85573 292 0. ↑ "How to: make a liquid that's also a solid". bbc.co.uk. 2013-08-05. Retrieved 2016-12-03. ↑ "Ingredient Substitution". JoyofBaking.com. 2007-09-11. Retrieved 2011-06-12. ↑ Bilge Altunaker; Sepil Sahin; Gulum Sumnu (March 2004). "Functionality of batters containing different starch types for deep-fat frying of chicken nuggets". European Food Research and Technology. 218 (4): 318–322. doi:10.1007/s00217-003-0854-5. ↑ "The Free Lance-Star - Google News Archive Search". Retrieved 14 May 2016. ↑ "Medical Glove Powder Report". Fda.gov. Retrieved 2016-05-14. ↑ "GSD Type 1". GSD Life. Retrieved 2013-10-31. ↑ "International Starch: Production of corn starch". Starch.dk. Retrieved 2011-06-12. ↑ "Maizena". Maizena marca registrada. Retrieved 2013-04-17.